The WSXC 20 Optical Orientation Device is used to determine the orientation of a crystal or to align a crystal so the specifically oriented surface can be cut. Special adapter for fixing goniometer on the Unipress saw. WSXC20 uses a laser beam reflected from a cleaved or preferentialy etched crystal surface back onto a target that is perpendicular to the laser beam.This type of orientation can be very accurate however it depends on getting a good reflection of the laser beam. With resolution of less than beam diameter, on a distance of 50 cm between the target and the face of the crystal, it is easy to reach an accuracy of 0.02° on the goniometer. The base of the WSXC-20 optical orientation instrument is a 750 mm long optical track. A 0.5 milliwatt laser is mounted on the end of the track. Attached to the output side of the laser is a 120 mm diameter round target that has been factory adjusted to be concentric and perpendicular to the laser beam. 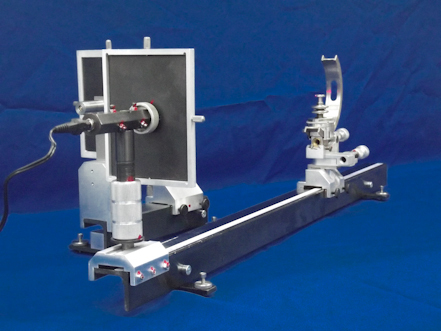 The mount that holds laser on track has both horizontal and vertical adjustments that are used to position laser beam parallel to optical track and to goniometer face with all settings at zero. This device works in the same way as WSXC-20 but is equipped with a more accurate and user friendly semi three axis WSG-02 goniometer.